In today’s post, we will see why protein bars are good for you. To be more specific: why high quality, nutrient rich, low sugar protein bars are good for you – because I’m here to tell you that not all protein bars are created equal! Protein bars are now a common sight in gym bags throughout the world, having surged in popularity over the last decade with an increase of 169% usage over that time. But why is that the case? And what distinguishes a superior health product, like our EnergyFirst Gourmet high protein bars, from those of a poor competitor? The statistics show that more people than ever are sold on the benefits of eating protein bars, but what do these health products actually do on a physiological level? According to the National Strength and Conditioning Association (NSCA), taking on protein post-workout helps to increase muscle bulk, decrease recovery time and reduce soreness. Daniel Moore and his colleagues tested one of these claims when they conducted a scientific study into the muscle-building performance of protein. They measured if – and by how much – ingestion of egg protein affected protein synthesis in the muscles of young men, following a bout of resistance exercise. The research team concluded that 20g of ingested protein was enough to cause a burst of albumin protein synthesis (APS) within muscle tissue. However, the American Council on Exercise (ACE) have stressed that it is important to choose the right type of protein bar – containing the right type of protein – to achieve a positive result. Bars containing whey, or a mixture of whey and other protein sources are preferable. As this SFGate feature explains, protein from animal whey and soy introduces essential amino acids which act to repair damaged muscle tissue, synthesize blood cells and manufacture hormones and enzymes. Protein bars also fit very nicely into our modern ‘on the go’ lifestyle where preparing fully balanced nutritional meals is a luxury most of us are denied – at least on a regular basis. In contrast, a protein bar can be quickly consumed, leaving us free to focus on other aspects of our lives. Healthy protein bars can also pack a surprisingly tasty punch, and its worth mentioning here that our EnergyFirst Permalean® bars use only natural flavours (try out our best tasting protein bars such as Peanut Butter Crunch, Chocolate Chip Cookie and Cookies and Cream varieties). The first thing to understand is that a healthy label does not a healthy product make! There are products for sale that are marketed as ‘best protein bars’ when they contain only slightly more protein than a peanut-filled candy bar, for example. There has been a lot of nutritional research over the past ten years which means that there are many more good quality products produced today and many more educated consumers to buy them. Unfortunately there are also many charlatans who jump on the ‘healthy food’ bandwagon and try to pass off inferior protein bars using slick marketing and branding techniques (which have also come a long way, of course). Fortunately, the FSA has ensured that labeling needs to be better than ever and so we can always see exactly what is in our ‘health’ foods if we choose to look. The first element to look for in a pure protein protein bar is, of course, the amount of protein it contains. It is recommended that we each consume at least 50g per day and, as the Moore study above shows, taking in 20g of protein has proven benefits so it makes sense to make this figure a benchmark. Of course, best protein bars don’t just contain protein and the best products include a balance of protein, carbohydrate, fat, vitamins and minerals to sustain you through your workout. However, many so-called protein bars contain far more sugar than is needed. As a guide, a protein bar containing more than 25g sugar should be avoided, although a man could get away with a bar containing up to 37.5g. The deleterious effects of consuming too much sugar are spelt out in one of my previous articles, which asks the question: Sugar: A Sweet “Poison”? As well as sugars, there are likely to be other carbohydrates present and this complicates matters a little. A handy rule of thumb to follow when shopping around is to subtract the amount of fiber (in grams) from the carbohydrate value and compare this result with the amount of protein present; if there is more protein than carbs then this is a positive sign. Are you looking mainly to lose weight or build bulk? Carbohydrates, together with fat content, will have a huge bearing on the overall calorific value of the bar and, as this Bodybuilding.com article reveals, calorific content can range from 70 to nearly 500 per bar – a huge difference! Weight loss expert Jillian Michaels explains that if you are targeting weight loss and/or eating protein bars between meals it is best to stick to a bar that contains around 220 calories. On the other hand, 300 or even 400 calories may be acceptable if you are eating protein bars to replace meals and/or looking purely to add bulk. Returning to fiber; if a bar has a high fiber content you can consider that an extra bonus, particularly if these are pre-biotic super-fibers such as inulin and isomalto-oligosaccharides, as explained in this Calories Proper piece. So far then, we have discovered that the best protein bars are those with at least 20g of soy or animal whey protein and less than this amount of net carbohydrates (i.e total carbohydrates minus fiber). High levels of fiber, minerals and vitamins are a bonus but the most suitable calorific value will depend on your overall nutritional strategy (as well as a range of factors including age, gender and activity levels). When researching the good protein bars for overall nutrition, you’ll find that our EnergyFirst Permalean® bars tick all of the boxes signifying a quality product. For a start, Permalean® exceeds the magic number of 20g from the Moore study by packing in 23g of whey protein. Total carbohydrates also amount to 23g, but at least 9g (depending on the flavour) is fiber, including pre-biotic isomalto-oligosaccharides, leaving net carbohydrates well behind protein. 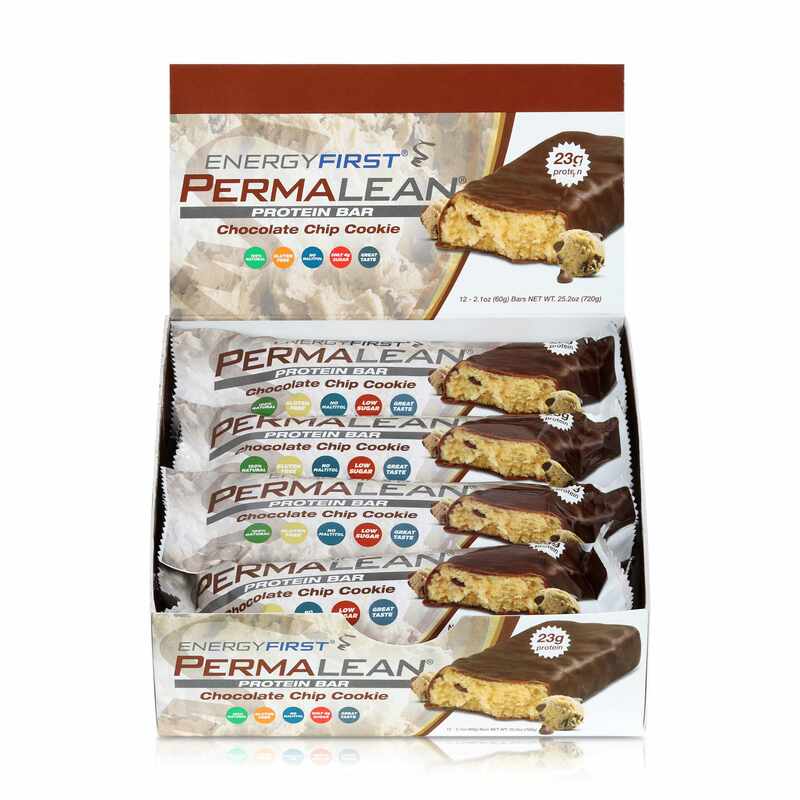 With only 4g of sugar per bar, Permalean® is well below recommended maximums here too and is also gluten-free. Also available on reduced rate in box of 12 as a multi-pack. So now you know why protein bars can be good for you, and how to sort the healthy types from the pretenders, you should be able to set aside the marketing buzz and make a sound, evidence-based decision on whether to join the protein bar fan club.